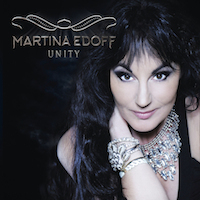 It was only one year since Martina Edoff released her self titled debut solo album (reviewed here). Since that album was a bit underwhelming, I can honestly say that I didn’t have the highest of hopes for this one either. The fact that miss Edoff is an amazing singer with a voice with an impressive range is pretty old news and everyone who has seen (or heard) her Heart tribute band Heart Attack knows that Edoff’s range is almost without limits. However, when she released her debut record, her Jill Johnson (that’s Swedish for Shania Twain, folks) goes AOR kind of rock turned out to be somewhat mediocre. I’m not gonna say that Martina’s album was a pile of crap, far from it, the album was good as in ok, but too forgettable. The sound was safe and the songs lacked bite and attack and the album’s only real high quality was Edoff’s voice. So what would be different this time, then? Well, quite a lot, I would be wise. First, the beautiful miss Edoff (I swear that woman get more and more gorgeous every year) has teamed up with H.E.A.T. keyboard player Jona Tee for song writing duties – five of the songs are co-written by Edoff and Tee and one song is written by H.E.A.T. drummer Crash. Erik Mårtensson (Eclipse, W.E.T., Ammunition) and Åge-Sten Nilsen (Ammunition, ex-Wig Wam) are responsible for co-writing one track. Also, Martina have recruited the whole of H.E.A.T. minus singer Erik Grönwall as her backing band for the record. All of a sudden things were looking a bit brighter and I got the feeling that this record might be an improvement after all. When Martina posted her video for first single “World Has Gone Mad” all over social media, my curiosity took the best of me and I had to watch it. First listen to the song made me stand up and listen – the song was good, much better than anything I have heard from her before. All of a sudden things had turned around and I had gone from no expectations to at least some expectations. And they rose every time I watched her video, because I liked the song so much I had to watch it over and over again. The fact that Martina is really easy to rest your eyes on didn’t hurt either. I know, those things are really secondary and it should be all about the music, but hey, I’m a man and we kinda notice those things, see. It is with some anticipation and a curious mind that I push play for the first time. The Mårtensson / Nilsen co-written title track opens the album and I can hear that this album will have more to offer right on the spot. It’s an up-tempo, in-your-face AOR /melodic rock killer that would stand up fine on an album with Eclipse or Ammunition. I must admit, I was a bit taken aback by how great this song is and it built up some expectations for the rest of the ride. “Never Let You Down” sports an infectious groove and the song make me think of when Nightwish take their more melodic rock turns with Anette Olzon at the mike and leave the opera at home. The melodies are just über catchy and I guess this might be a single at some point – brilliant! Next up, the first single “World Has Gone Mad” and if I liked it much listening at home, it’s nothing compared to what I felt the first time with headphones on. I’m floored – totally floored. This, ladies and gents, is melodic rock heaven! If this song don’t become a hit, something is wrong in the cosmos. The contagious groove and the amazing refrain would make Desmond Child sell his kids (if he have any) to write. Also, had this song been released as a single in 1990, this album would have gone multi-platinum and Martina would have lived in a mansion in Beverly Hills, believe you me! “Spirit Of Light” is a heavy AOR-ballad, very catchy and emotional and I believe this will have to be a single as well. “Come Alive” is a H.E.A.T. smelling rocker – a bit of ironic as it wasn’t written by anyone in that band – and melodic hard rock at its best. It also comes with some cool metal riffing in the verses which breaks the mold a bit. “I Am Mining” is a brilliant pop-rocker that sounds a bit like the stuff Swedish singer Erika (you know, Yngwie Malmsteen’s ex-wife) used to provide us with in the early 90’s. Only better. Lots better, actually! After that we have another – you guessed it – killer tune. “Love Keeps Turning Away” sounds like the perfect mix of H.E.A.T. and Treat with a female vocalist. This is a hit, I tell ya. A hit! Again, single material – and then some. “Moment Of Truth” is another awesome pop-rock ballad and in 1990 a song like this would have been all over MTV and shipped this album another couple of millions and Martina would now own a nice house in Aspen as well. I miss 1990! “Sound Of Thunder” is a dream for lovers of AOR and melodic rock. This is pop-metal with an AOR twist and I hear more H.E.A.T., but also Heart and Mitch Malloy. The chorus is a jawbreaker! “This Love Is Crazy” is the only track on this CD that don’t make my heart skip a beat. It’s a good melodic rocker, but it doesn’t set my world alight, for some reason. “Caught In The Middle” might be a title used to death, but the song is nothing short of amazing. This is really more of a hard rock number with a fine twist of melodic rock. The guitar riffs are stunningly good and the song really rocks. This belong in 1991 but it doesn’t sound dated one bit. It only leave me wanting more. Wow! That’s really all I can say. Wow! This is not what I had expected at all. This what I call moving forward and developing. Everything I asked for in my review for her debut album are here. It’s not safe, the whole production has bite, the guitars dominates and Martina sings with a lot more attitude and conviction. When you hire a band like H.E.A.T. to take care of the playing, you really can’t go wrong. The musical performances on this album is faultless – to speak mildly. Also, the production here is top-notch, which is no surprise when you consider that Tobias Lindell (Europe, Mustasch, H.E.A.T., Nubian Rose) is responsible. This records sounds like a million bucks! It also contains like nine songs with single potential out of eleven. Impressing much? You bet! If this music isn’t your can of beer then it doesn’t matter how well this album is recorded and how great the songs are, you still won’t dig it. But for fans of melodic rock and AOR, this kind of music really don’t get much better than this. Only one worrying thought comes into my head after listening to this album – how on Earth will she manage to top this when it’s time for album # 3? Well, that’s a worry for another day, right now let’s just enjoy this phenomenal piece of music!